A Do acreage reduction programs restrict farm income? One of the changes that the 1996 Farm Bill made to federal agricultural policy was the elimination of acreage control programs. This change reflected the intent of the authors of that legislation to design a market oriented program that would use free market forces to bring about needed adjustments in supply and demand of the agricultural commodities that had been subject to acreage control programs for many years. During the debate for the 1996 Farm Bill’s replacement, any suggestion of acreage controls has been greeted with comments about a “return to the failed policies of the past.” Even though production controls may bring about higher prices, some have suggested that the reduced production still means lower farm incomes. We decided to look up the data. Did income drop during years when acreage control programs were in effect? Over the last 21 years, acreage control programs were in effect for the 1980 through 1995 crop years. From 1996 to 2000 acreage control programs were not in effect. For our study, we looked at corn because it is one of the two largest commodities affected by acreage reduction programs. 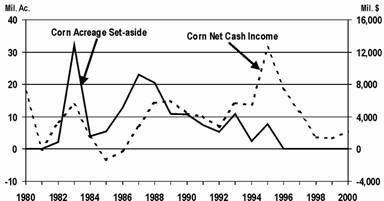 To approximate corn net cash income for those years we multiplied annual disappearance by the season average price and then adjusted the number to account for corn that moved in and out of government storage. We then subtracted variable/operating cash expenses plus out-of-pocket fixed costs. This corn net cash income number is in essence the farmer’s take home pay before taxes. The procedure assumes that corn fed to livestock on the farms where the corn was produced is valued as if it were sold at the season average price. The results are shown in figure 1. The solid line uses the left hand scale and shows the amount of corn acreage set aside each year from 1980 to 2000. Corn net cash income is indicated by the dotted line and uses the right hand scale. As you can see, for most years, there is a positive association between corn acreage set-asides and corn net cash income. This is especially clear when you look at the last five years. Since acreage reduction programs were eliminated with the 1996 Farm Bill, market-derived corn net cash income has plummeted. The data do not support the oft-heard assertion that “when we restrict farm production, we restrict income.” In fact the data show that acreage reduction programs tend to INCREASE net cash income at the farm level.